Born in Garafraxa Township, Wellington County, Ontario on 19 April 1865, son of the Reverend F. M. and Mrs. Finn, he was educated at Ontario public and Winnipeg high schools. Has taken extra mural work, University of Manitoba. Of Irish stock, his grandfather came to Canada from Sligo, Ireland and settled in Wellington county. His mother’s people were United Empire Loyalists who settled at Lake Simcoe. His father was a Methodist minister who filled various charges in the east and finally came to Manitoba in 1882 where he held the charges of Carman, Morris, Carberry and was Chaplain of the Stony Mountain Penitentiary for ten years. He taught at Boyne School (1883-1892), Portage la Prairie (1892-1896), Crystal City (1896-1899), and Cypress River School (1901). He entered the newspaper business at Crystal City, buying the Crystal City Courier in 1899. Four years later, he went to Morden as Principal of the Collegiate Departmental School, remaining there eight and a half years. 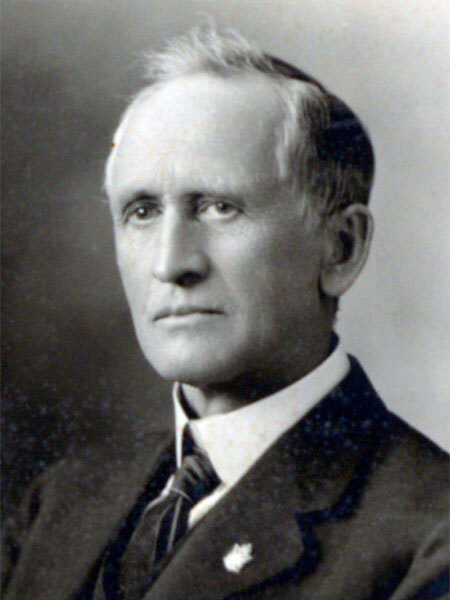 He was appointed a Manitoba Schools Inspector in 1911. Prior to the First World War, he served in 18th Mounted Rifles. He joined the Canadian Expeditionary Force in August 1914 and went to Valcartier, Quebec as Captain and Assistant Adjutant of the 6th Fort Garrys, which he accompanied to England. He returned to Canada and joined the 45th Battalion as Quartermaster and went overseas again and on account of his advanced age was retained in England. He returned to Canada and was discharged in October 1916, whereupon he resumed his position as School Inspector. He retired from the position in 1929. On 30 June 1890, he married Charlotte Augusta Elford of Carman. They had six daughters: Francis Irene Finn (b 1891, wife of Martin A. McLaren), Laura Honora Finn (b 1892, wife of David S. Borthwick), Vera Elford Finn (1896-1901), Edith Mary Susan Finn (b 1903), Ruth Kathleen Finn (b 1906), and Evelyn Elford Finn (b 1907, wife of Edward F. Dilliston). He served on the board of the Morden Masonic Hospital. He was a member of the Masons (serving as Past Worshipful Master of Belmont Lodge No. 13 at Morden), Knights of Pythias (Past Chancellor Commander of Stanley Lodge No. 16), the IOOF (Past Noble Grand of Nelson Lodge No. 9), and the Methodist Church. He died at Morden on 15 March 1934 and was buried in the Hillside Cemetery. “Theodore G. Finn, well known educationist, dies at Morden, Man.,” Manitoba Free Press, 16 March 1934, page 3. We thank Al Thorleifson for providing additional information used here.